If you value your health, but you aren’t lifting weights, you may be missing some key elements of a healthy lifestyle. For women over 40, weight lifting for health is vital. Here’s another new one for me…lifting weights…and I am kicking myself for not doing it sooner. I am so excited about the weight lifting I have been doing and the results from it! As usual, I am thrilled to share this experience with you so you too can feel this good and have some additional results to celebrate. I am so excited about the weight lifting I have been doing and the results from it! As usual, I am thrilled to share this experience with you so you too can feel this good and have some additional results to celebrate. My goal is not to be a bodybuilder nor is it to be a bulky muscular woman. Like many of you, I hesitated to lift any weight for a while for fear I would bulk up, not really understanding how weight training works for women. My goal is likely the same goal you have, to be lean and toned. Skinny is my old goal, now I work to be lean and toned. There was a time years ago when skinny worked for me. But now that I am over 40 years old, my muscles had withered away and I soon realized skinny also meant flabby. 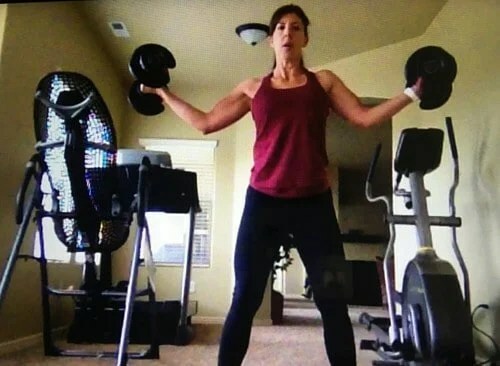 Like many of you, I hesitated to lift any weight for a while for fear I would bulk up, not really understanding how weight training works for women. My goal is likely the same goal you have, to be lean and toned. Skinny is my old goal, now I work to be lean and toned. There was a time years ago when skinny worked for me. But now that I am over 40 years old, my muscles had withered away and I soon realized skinny also meant flabby. Skinny is my old goal, now I work to be lean and toned. There was a time years ago when skinny worked for me. But now that I am over 40 years old, my muscles had withered away and I soon realized skinny also meant flabby. The exercises I had done in the past few years did give me some toning and strengthening, but not to the degree I have built in the last couple of months. I started this program to tone my thighs and glutes, however, I soon realized how all of my muscles needed some toning. The weight lifting has given every muscle that added “oomph” and I have 6 pack abs coming in and am losing the flabby arms to a level I had not been able to achieve prior to this program. I started this program to tone my thighs and glutes, however, I soon realized how all of my muscles needed some toning. The weight lifting has given every muscle that added “oomph” and I have 6 pack abs coming in and am losing the flabby arms to a level I had not been able to achieve prior to this program. I really can’t express to you how important lifting weights can be for us, women over 40. It is the part of the equation that we are missing when we get to this age…muscle, solid muscle. It is the part of the equation that we are missing when we get to this age…muscle, solid muscle. But don’t just take my word for it. Look at these science backed reasons below. Metabolism is the “magic little army” working to burn calories all throughout the day. Metabolism levels are different for everyone and are determined by the amount of muscle we have. For most people, metabolism slows down dramatically as we age because the muscles atrophy when they are not being used, thus, decreasing our metabolism and causes weight gain. 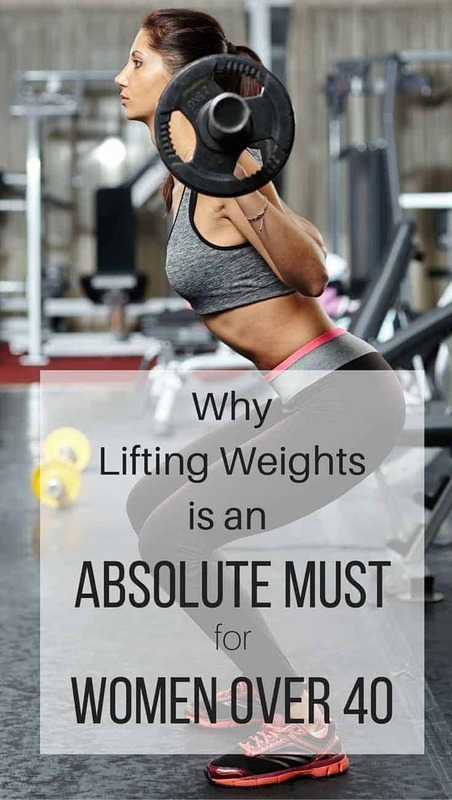 When we lift weights, we keep the muscles active.Weight lifting builds type II muscle fibers, which has been proven to reduce body fat through the increased metabolism. For most people, metabolism slows down dramatically as we age because the muscles atrophy when they are not being used, thus, decreasing our metabolism and causes weight gain. Most of us know that cardio exercise releases endorphins, chemicals that help us to give us the feeling of positive outlook and an extra pep in our step. I also believe just being happier with our image gives us a boost of self-confidence that in turn helps our general mood to feel happier and fulfilled. I also believe just being happier with our image gives us a boost of self-confidence that in turn helps our general mood to feel happier and fulfilled. A common medical condition for women over 40 is osteoporosis. Studies have shown our bones strengthen when they feel the stress (more like perceived stress) of weight lifting. Not to say we need to lift weights heavier than we are comfortable with. Not to say we need to lift weights heavier than we are comfortable with. This is such a big category. But think about the daily or occasional activities that cause aches and pains. When weight lifting has been part of your routine, those muscles aid in things like gardening, housework, sitting at a desk working, you name it, the muscles have your back, literally. Your core is strengthened which protects your joints and bones from injury as you move around. Sitting at your desk is done with better posture because your spine is lifted properly with the muscle growth of weight lifting. Your balance is better with leg and core muscles that allow you to move more freely to do the things you want. If you play a sport, you will notice more exactness and speed in your movements. When weight lifting has been part of your routine, those muscles aid in things like gardening, housework, sitting at a desk working, you name it, the muscles have your back, literally. Your core is strengthened which protects your joints and bones from injury as you move around. What the heck are white muscles, right? We have red and white muscles. The red are responsible for fat oxidation (big word for fat cells being made smaller) and to generate energy. The white muscles directly use glucose for energy – weight lifting and sprints directly increase the white muscle fibers. What is the biggest difference in our bodies now vs 20 years ago? We had muscles back then! We didn’t really have to work for the muscles too much then, but over time they have atrophied. Lose inches and look great by building your muscle tone. Okay, so maybe that is more info than you needed to be convinced to start weight lifting today. Bottom line is our muscles are an important part of our body that helps us be healthier, leaner and basically reverses the aging process. Lifting weights is one of those snowballs at the top of the hill. So many wonderful effects when women over 40 lift weights. If I had to choose a favorite, it would be – the more muscle, the more calorie burn we have – specifically fat burn. The last thing to worry about is bulking up like a bodybuilder. It takes a lot of effort to bulk up such as eating a whole lot of proteins, calories, and a whole lotta weight lifting. Women just don’t have the amount of testosterone that men do and that is why men bulk up differently than women. Women over 40 must lift weights regularly to help meet the goal of being lean and toned. Lifting weights is about working smarter, not harder. Lifting weights restores the muscle loss that comes with aging and restores the metabolism we had a younger age. A great place to start is with the Fit Found Me workout calendar (get your copy here) utilizing body weight to build muscles. Be sure to subscribe to the Fit Found Me daily emails to get a workout a day. Be sure to subscribe to the Fit Found Me daily emails to get a workout a day. For additional info on weight training for beginners, check out 7 Ways Weight Training For Women Isn’t What You Thought. Good content, informative and helpful. Will recommend this to my mom and aunt. Thanks for posting. Thanks Su, Glad it was helpful!